Friday night we went to Halls Pumpkin Farm with the Osbornes. Courtney, Charis, Me and Katie, Stephen and Drew. We went on a hayride and got to stop and feed the animals! 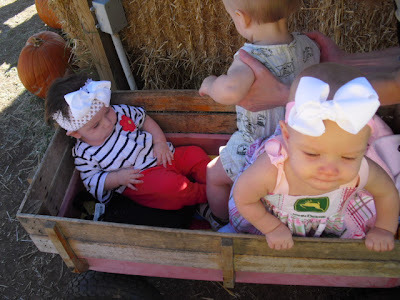 Here is Katie, Charis and Drew at their first pumpkin patch experience 2 years ago. Katie was 3 months old and the twins were 10 months old. I am so glad Katie has these guys to grow up with. They are her surrogate siblings! Then on Saturday we had our 10th graders from church over. The girls came over first and we painted pumpkins. Katie wanted to join in too. I was hesitant at first, but she did great! Those cute polka dot shoes were part of the big garage sale load I told you about yesterday! Yay! Marcus made some yummy BBQ and his teaching partner, Jason, brought his fryer. So we had fried Oreos, cinnamon buns, donut holes, Twinkies and sugar wafers. Thankfully nobody had a heart attack! It was SO good! Katie loved her fried Oreo. We had such a fun night. When you mix pumpkin painting, fried stuff and teenagers how could you NOT have fun? If you don't mind my asking, where did you the pumpkin shirt Katie is wearing in the later pictures? It is SO cute!!! Love Katie's shirt, your bubble necklace, the painted pumpkins... and ohmyheavens... I would give anything to have a FRIED OREO! Or anything fried for that matter! Heck, even a regular oreo would make my day! Ha! I'm off to eat a salad. Ugh! Both of Katie's pumpkin shirts are made by my friend Kari. She has a facebook page and an etsy site. Her business is called the embroidery boutique located in Southlake TX.